Nokia 603 is a new member of Symbian family. This handset is powered by a 1GHz processor so allow you to browse the web pages as quickly as you can. We already inform you about 603 when it was not official but now you will feel great as today we have complete details of it such as specs, price and release date. With the integration of NFC technology, you can mobilize and share your videos and content with your buddies and friends. A 3.5 inch ClearBlack LCD with IPS technology lets you to get clear and crisp visuals. This display comes with nHD resolution (360 x 640 pixels) and 1000 nits brightness that’s mean you will be able to enjoy wonderful graphics of games and movies. You can get personalize experience through Nokia 603 as there are six home screens to select from. Although it will come in two main colors such as black and white yet it will offer you a customization option i.e. you can pick your favorite back cover from a wide variety of colors. 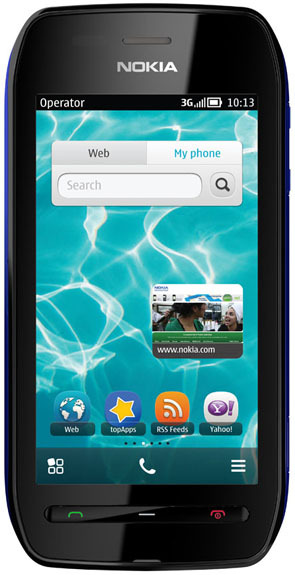 Nokia 603 supports both quad-band 2G and tri-band 3G with 14 Mbps HSDPA and 5.7 Mbps HSUPA. If you want to connect the device locally then there are there are usual options such as GPS, Wi-Fi, Bluetooth, and USB. This Symbian Smartphone has 2GB storage space on board but you can get 32GB more through a microSD card slot. Other features of Nokia 603 include an FM radio, a 3.5 mm audio jack, 5MP fixed-focus camera capable of recording video at 720p. You will definitely miss a front facing snapper in this handset of Nokia. Nokia 603 Symbian Belle handset will be release in UK market with the price tag of £175. Watch The Video of Nokia 603 and then Learn how to Customize, Mobilize and Personalize this Smartphone.